The handsome, Spanish-style home on the corner of Beachcomber Lane and Sea Lark Road in Houston couldn't look any more idyllic. With its charming brick exteriors, and leafy, tree-flanked lawn, the cosy three-bedroom property is picture perfect. But behind its pretty doors lies a gruesome past. 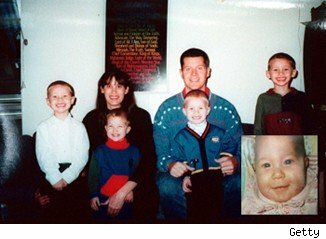 It's where 37-year-old mom Andrea Yates (pictured below right) drowned her five children -- including her 6-month-old daughter -- in a bathtub in 2001. Yates was later convicted of murder and sentenced to life in prison. Three years later, a man named Peter Muller purchased the house -- which had, unsurprisingly, become a neighborhood "attraction" -- and has been living there ever since. Unlike many house hunters who are uneasy about purchasing a stigmatized home, Muller had no reservations about buying the infamous "Yates murder home." "I really don't care about [the home's] history," Muller told AOL Real Estate. "I don't think about it, it doesn't bother me." Its horrifying history aside, it's not hard to see why Muller bought the home in 2004 for $87,000. (It is now valued at $110,000; Muller believes it is worth more than $120,000.) It boasts a wealth of desirable qualities, including its proximity to Houston's city center and a number of schools and hospitals. "It's in a good location," Muller said. "Plus, it's got a great layout. There's a living area and combined dining area." Muller, who lives in the 1,620-square-foot home alone with his dog, Chotty, said that despite the hefty return he might make from the sale of the home, he doesn't plan to sell or leave 942 Beachcomber Lane in the near future. When asked if he was happy living there, Muller said: "Sure. It has everything I need." Serial killer Anthony Sowell murdered 11 women in this Cleveland home. Ronald "Butch" DeFeo Jr. murdered six members of his family in this home in 1974. The home, nicknamed the "Amityville Horror House," and the subject of a book and movie series, is claimed to be haunted. Andrea Yates drowned her five children in a bathtub at this home in a district of Houston in 2001. In this home in 1892, Lizzie Borden was famously alleged to have brutally murdered her father and stepmother with an ax. The house is now a bed and breakfast. It was in this home that socialite Betty Broderick shot and killed her former husband and his new girlfriend, in 1982. Fashion writer Christa Worthington of Harper's Bazaar and The New York Times was found murdered in this home on Cape Cod in 2002. Four years later, sanitation worker Christopher McCowen was convicted of the crime. It was here that former Marine Chris Coleman, a security chief for a televangelist, strangled his wife, Sheri, and two children to death in 2009. It was in this condominium building that Steven Schulhoff was beaten to death with a baseball bat in 2004 by his daughter Courtney's boyfriend, Michael Morin, after the pair (pictured) conspired to kill him. It was here that serial killer Gary Ridgway, known as the "Green River Killer," murdered four women. Mining heiress Elisabeth Congdon's body was found in a bedroom wing of this mansion. Her night nurse, Velma Pietila, was also found dead on the staircase landing of the 39-room home facing Lake Superior in 1977. Congdon's son-in-law was convicted of second degree murder in the case. This residence is where 6-year-old JonBenet Ramsey was murdered in December 1996 in a notoriously unsolved case. This modest 879-square-foot home has been the setting for two unrelated homicides. In 1990, 69-year-old Joyce C. Crandall was shot and stabbed multiple times, and later discovered by a Meals-on-Wheels volunteer. Timothy Granderson, a neighbor's son who did odd-jobs around the house for Crandall, was charged with the murder. Then in 2009, homeowner Barnell Amos and 9-year-old houseguest Devin Elliot were shot during a late-night robbery. These latter murders remain unsolved, and the three-bedroom house sits vacant. If it is someday listed for sale, Michigan state property disclosure laws do not require agents to share the home’s history with buyers. In this home, over a span of 40 years, four members of the wealthy Lemp family committed suicide. Pioneering punk-rock manager and celebrity real estate broker Linda Stein was murdered in her 18th floor apartment in this building by her personal assistant, Natavia Lowery (pictured). In one of Indiana's most notorious crimes, 16-year-old Sylvia Likens was tortured to death at this house in 1965 by a woman who was paid to care for her, that woman's two children and two neighborhood youths. Italian designer Gianni Versace lived at this palatial South Beach home and was murdered at its gate. The suspected gunman, Andrew Phillip Cunanan, was found dead eight days later. This since-demolished home belonged to serial killer Ed Gein, where in the 1950s he lived a deceptively quiet life and where parts of his many victims' bodies were found. 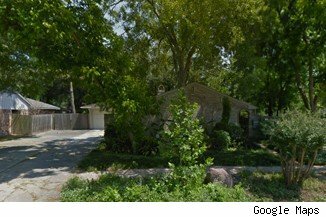 This was the Edgemoor Street home of the Otero family, four members of which died there at the hands of notorious Wichita serial killer Dennis Rader, also known as the BTK killer. Dennis Rader received 10 life terms and a "hard 40" for the 10 murders he committed over nearly 30 years. It was at his hilltop home that legendary record producer Phil Spector killed actress Lana Clarkson in 2003. Though many may balk at living in a home where brutal murders have occurred, studies reveal that murder homes can be excellent bargains if potential buyers can accept the property's tainted past. A buyer can expect to pay 10 percent to 25 percent off regular market prices for stigmatized homes, said real estate consultant Randall Bell of Bell Anderson & Saunders, which specializes in assessing disaster-damaged properties and murder homes -- such as the one where Jon-Benet Ramsey was killed. Depending on the severity of the crime, the discounts can get even steeper. Take, for example, the Los Angeles home where O.J. Simpson was accused of killing ex-wife Nicole Brown Simpson and her friend Ronald Goldman. After two years on the market, it sold for only $590,000 -- $200,000 less than the initial asking price. Similarly, the Southern California home where 39 members of the Heaven's Gate cult killed themselves in 1997 was sold for $668,000 two years after the event. That was less than half of the mansion's $1.6 million listing price before the infamous mass suicide. For some, such hefty markdowns are enough of an incentive to push any initial reservations aside. That was the case for Chris Butler, who happened upon a beautiful, split-level ranch (pictured left) nestled in the lush forests of Akron, Ohio, in 2005. Butler immediately contacted the home's realtor, Greg Greco, who showed him around the three-bedroom home and its 2-acre lot, a property that Butler swiftly "fell in love with." The going price? A mere $269,000. Days later, Butler received an unsettling phone call from Greco "in the interest of full disclosure," he was told. 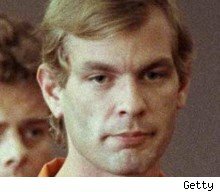 Greco revealed that the property was priced so low because of its past: It once was the home of serial killer Jeffrey Dahmer (pictured below right) and the site of Dahmer's first murder. 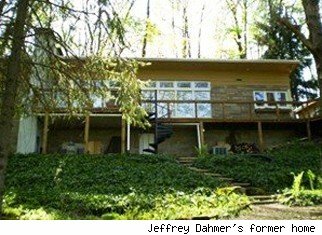 It was here that Dahmer killed 19-year-old Steven Hicks with a barbell, dismembered his body and buried it in the woods surrounding the home. "My first reaction, of course, was 'eww,' " Butler told AOL Real Estate. "But then I went and really thought about it, and it was actually kind of creepy-cool. Besides, the house was perfect. So I went ahead and bought it." Butler ended up purchasing the home for an even lower price of $245,000 -- more than $100,000 less than comparable homes in the area. Even with the savings, however, there are still some common -- and valid -- concerns for prospective owners of a stigmatized home. According to Bell, homebuyers often worry about the property's resale value. (This doesn't concern Butler, who, after seven years, is selling his home for $329,000 to move East.) 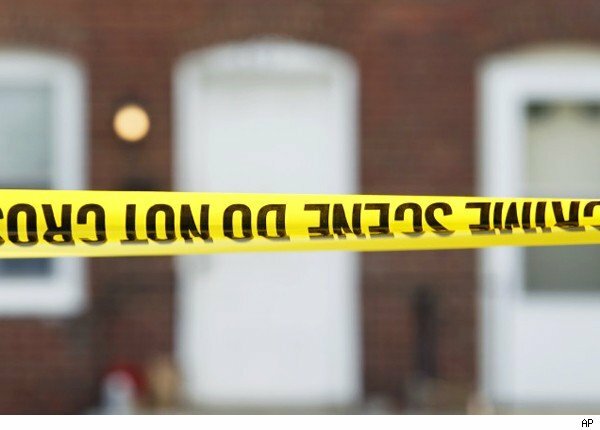 Additionally, Bell said, homes where homicides or other heinous crimes took place will typically stay on the market from two to seven years longer than they would otherwise. But Bell said that, generally, homebuyers -- particularly bargain hunters looking for fixer-uppers -- can be convinced to buy a notorious crime scene if the price is right. "In large, it all comes down to finding the right discount to entice a buyer to accept the property along with its tainted history," Bell told AOL Real Estate. For some strong-stomached -- and business-minded -- buyers, purchasing a stigmatized property has turned out to be quite a lucrative investment. It certainly was for the owners of 3322 DeMenil Place. The sprawling, Victorian-style mansion in St. Louis, Mo., was the place where four members of the high-profile Lemp family committed suicide. In fact, Mark Halim, the property's manager of 14 years, said the home has been the site of "full-body apparitions" and paranormal activity, which has been confirmed by "certified electronic voice phenomena technicians" and paranormal investigators. (The mansion was once named by Life magazine as one of the "nine most haunted homes in America"). Instead of exorcising or razing the supposedly haunted property, however, Halim said the Pointer family, the home's current owners, turned it into a bed and breakfast in 1975. "It was a natural progression," Halim said. "They had already begun to start using [the home] as a boarding house." Currently, Halim said, about half of the guests visiting the bed and breakfast come there in hopes of Lemp ghost sightings. 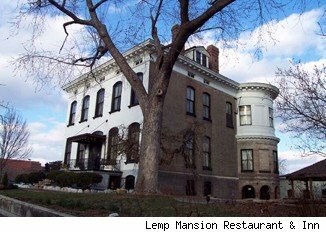 Historical and haunted tours are offered there, and the wildly popular "Lemp Mansion Restaurant and Inn" is booked almost every weekend until 2014. Room rates begin at $125 a night. Similarly, the Fall River, Mass., home where Lizzie Borden purportedly hacked to death her father, Andrew, and stepmother, Abby, is now the famous Lizzie Borden Bed & Breakfast Museum. ("Where everyone is treated like family," is the B&B's motto). Room rates start at $200 off-season, and the entire house can be rented for weddings and events starting at $1,500 per night. Though there are upsides to purchasing a stigmatized property, many house hunters are adamantly opposed to living in a home where a crime once occurred. From blogs to online polls, it's obvious that people struggle with the idea of living in a home where someone was murdered, no matter how low it's priced. Even if a potential buyer can somehow wrap their mind around the idea of living there, neighbors' perceptions and third-party judgements can still act as a deterrent. Butler, for instance, described a time when a FedEx deliveryman refused to even come to the door. He added that his neighbors have also stayed away during his seven-year residence at Dahmer's former home, only making appearances "when their dogs ran away." "Some people are concerned that their kids will be teased or hassled by other kids," Bell said. "[They] feel that the crime stigma will distract from just living peacefully." But to such skeptics, Butler advised this: "Come out to my home in the summer, and sit on my deck in the sun with a gin-and-tonic in hand. Look out at the forest, breathe in the clean air, and get a feel of just how un-scary it is. "It may have a terrible history," he added. "But the house didn't kill anybody."